What we read influences our thoughts, feelings, and behaviors. 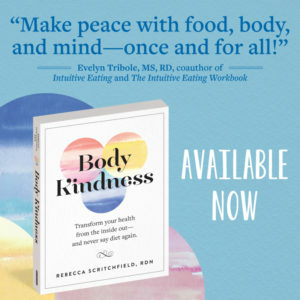 If you’re new to Body Kindness, taking action to pull in stories that will help enhance your anti-diet evolution and pushing away stories that strengthen FOMO and your inner critic can be a form of taking back your power. Even if you don’t see yourself as a writer, if you’re sharing content on social media, you’re educating and you’re standing for something. 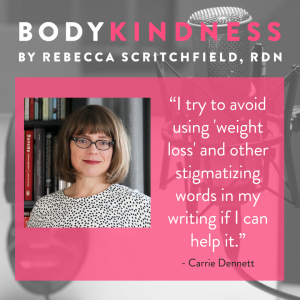 In this episode I talk to fellow career-changer HAES dietitian and journalist, Carrie Dennett. 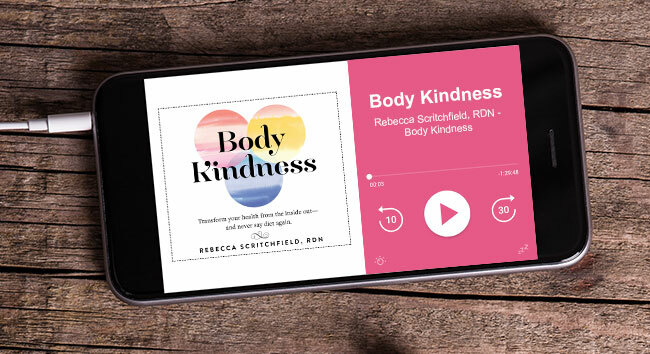 In our conversation, you’ll learn how to read and write better in the body positivity space and how you can take action when you read BS in the media. Carrie Dennett, MPH, RDN is a Seattle-based registered dietitian nutritionist, certified intuitive eating counselor, journalist and speaker. She is the nutrition columnist for The Seattle Times and writes regularly for The Washington Post and other publications. When she’s not writing, Carrie provides one-on-one nutrition counseling, helping people build better relationships with food through a non-diet, intuitive and mindful eating approach. Carrie has more than 200 cookbooks in her personal library and enjoys cooking, vegetable gardening and traveling when she’s not debunking nutrition myths or helping her clients lighten some of their food-related baggage.